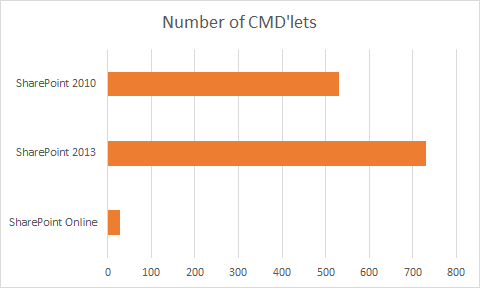 The support for PowerShell is somewhat better in 2013 and the number of features in the product has grown significantly, with that taken into account, the total number of CMD’lets in SharePoint Server 2013 is 730 Out of Box! This compared to SharePoint Server 2010 that has 531 CMD’lets (Aug-2011). Compared to that, the modest list of 27 CMD’lets in SharePoint Online in the wave 15 upgrade can hardly even be called PowerShell support. But, if looking at the original Office 365 release that had NONE/No PowerShell support for SharePoint it is a great leap forward, given that Microsoft has to solve a lot of issues running PowerShell commands against a remote instance in the cloud and never beeing able to have direct database access and so on, it is a pretty good start. I do however hope and think that Microsoft is investing in broader support in the future. I would for example love to be able to manage content and site/web configurations using PowerShell in SharePoint online as well as I can onprem today. Below are the complete lists of Onprem vs. Online commandlets available. My goal was from the beginning to make a comparison chart but the differences are to great, the Online list to short so the benefit would be little or none. Note: Remember that we do not necessarily have to stare ourselves blind only at the number of CMD’lets, one CMD’let can have better functionality as well. SharePoint 2013 CMD’lets The complete list of CMD’lets available out of box, an impressive list of 730. As you probably guessed, *New* means that it is new with 2013. Add-SPAppDeniedEndpoint *New* Adds an endpoint to the Apps denied endpoint list. Add-SPClaimTypeMapping *New* Adds a claim mapping to a trusted security token service (STS) identity provider. Add-SPDiagnosticsPerformanceCounter Adds an instance of a performance counter. Add-SPDistributedCacheServiceInstance *New* Adds an instance of the distributed cache service to a local server. Add-SPProfileLeader Adds a company leader. Add-SPRoutingMachineInfo *New* Adds a new routing target to the farm. Add-SPRoutingMachinePool *New* Adds a new machine pool. Add-SPRoutingRule *New* Adds a routing rule. Add-SPScaleOutDatabase *New* Adds an existing scale-out database to the specified service application. Add-SPSecureStoreSystemAccount *New* Adds an account to a designated list. Add-SPServerScaleOutDatabase *New* Adds an existing scale-out database to the specified service application. Add-SPSocialAppPermissions *New* Do not use this cmdlet. Add-SPThrottlingRule *New* Adds a new throttling rule. Add-SPUserLicenseMapping *New* Maps a security group, forms-based role, or claim to a SharePoint user license. Backup-SPEnterpriseSearchServiceApplicationIndex *New* Takes a backup of the search index to a specified backup location. Clear-SPAppDeniedEndpointList *New* Removes all App denied endpoints. Clear-SPBusinessDataCatalogEntityNotificationWeb Clears the entity notification site. Clear-SPDistributedCacheItem *New* Clears cached items from the distributed cache server. Clear-SPLogLevel Resets the Windows trace logging and event logging levels to their default values. Clear-SPScaleOutDatabaseDeletedDataSubRange *New* Clears all partitions inside the specified deleted subrange. Clear-SPScaleOutDatabaseLog *New* Clears all scale-out logs. Clear-SPScaleOutDatabaseTenantData *New* Removes all data related to the specified site subscription. Clear-SPSecureStoreCredentialMapping Deletes a credential mapping from a Secure Store Service application. Clear-SPSecureStoreDefaultProvider Clears the secure store provider. Clear-SPServerScaleOutDatabaseDeletedDataSubRange *New* Clears all partitions inside the specified deleted subrange. Clear-SPServerScaleOutDatabaseLog *New* Clears all scale-out logs. Clear-SPServerScaleOutDatabaseTenantData *New* Removes all data related to the specified site subscription. Clear-SPSiteSubscriptionBusinessDataCatalogConfig Deletes all data from the Business Data Connectivity Metadata Store for a specified partition. Connect-SPConfigurationDatabase Connects the local server computer to a farm. Convert-SPWebApplication *New* Converts the authentication mode of a web application. Copy-SPBusinessDataCatalogAclToChildren Copies a set of permissions of a Business Data Connectivity Metadata Store metadata object to its child objects. Copy-SPSite Makes a copy of a site collection. Disable-SPAppAutoProvision *New* Disables automatic provisioning of an app. Disable-SPBusinessDataCatalogEntity Deactivates an external content type in the Business Data Connectivity Metadata Store. Disable-SPFeature Disables an installed SharePoint feature at a given scope. Disable-SPInfoPathFormTemplate Deactivates an InfoPath 2013 form template from the specified site collection. Disable-SPSingleSignOn Disables the single sign-on (SSO) service on a farm server. Disable-SPTimerJob Disables a timer job. Disable-SPUserLicensing *New* Disables user license enforcement. Disable-SPWebApplicationHttpThrottling Turns off network throttling for a web application. Disconnect-SPConfigurationDatabase Disconnects the local server computer from the farm. Dismount-SPContentDatabase Detaches a content database from the web application it is currently associated with. Enable-SPAppAutoProvision *New* Enables automatic provisioning of an app. Enable-SPBusinessDataCatalogEntity Activates an external content type in the Business Data Connectivity Metadata Store. Enable-SPFeature Enables an installed SharePoint feature at the given scope. Enable-SPInfoPathFormTemplate Activates an InfoPath 2013 form template in the specified site collection. Enable-SPTimerJob Enables a timer job. Enable-SPUserLicensing *New* Enables user-license enforcement. Enable-SPWebApplicationHttpThrottling Turns on network throttling for a web application. Export-SPAppPackage *New* Exports an app package. Export-SPBusinessDataCatalogModel Exports a Business Data Connectivity Model. Export-SPEnterpriseSearchTopology Exports an existing search topology. Export-SPInfoPathAdministrationFiles Saves InfoPath 2013 form templates on the SharePoint Central Administration web site and .udcx files to a .cab file. Export-SPMetadataWebServicePartitionData Exports the data from a metadata Web service for a site subscription. Export-SPScaleOutDatabaseTenantData *New* Exports the data of the specified subscription. Export-SPServerScaleOutDatabaseTenantData *New* Exports the data of the specified subscription. Export-SPSiteSubscriptionBusinessDataCatalogConfig Exports all data from the Business Data Connectivity Metadata Store associated with a partition. Export-SPSiteSubscriptionSettings Creates a backup file of site subscription data. Export-SPWeb Exports a site collection, web application, list, or library. Get-SPAccessServiceApplication Returns an Access Services application or a collection of Access Services applications. Get-SPAccessServicesApplication *New* Returns an Access Services application or a collection of Access Services applications. Get-SPAccessServicesDatabase *New* Returns an Access Services database or a collection of Access Services databases. Get-SPAccessServicesDatabaseServer *New* Returns the settings for all application servers. Get-SPAccessServicesDatabaseServerGroup *New* Returns the settings for all application server groups. Get-SPAccessServicesDatabaseServerGroupMapping *New* Returns the mapping from a source package type to the database server group. Get-SPAlternateURL Returns all alternate URLs that match a given set of criteria. Get-SPAppAcquisitionConfiguration *New* Returns app acquisition settings. Get-SPAppAutoProvisionConnection *New* Returns provision connection settings for an app. Get-SPAppDeniedEndpointList *New* Returns the App denied endpoint list. Get-SPAppDisablingConfiguration *New* Returns the disable list sync state for an app. Get-SPAppDomain *New* Gets the domain used to host Apps. Get-SPAppHostingQuotaConfiguration *New* Returns the hosting quotas for an app. Get-SPAppInstance *New* Returns the hosting quotas for an app. Get-SPAppStoreConfiguration *New* Returns app SharePoint Store settings. Get-SPAppPrincipal *New* Displays a specific app principal object. Get-SPAppScaleProfile *New* Returns settings for an app profile. Get-SPAppSiteSubscriptionName *New* Returns the name of the specified site subscription. Get-SPAppStateSyncLastRunTime *New* Returns the latest time the app state update job was invoked. Get-SPAppStateUpdateInterval *New* Returns the interval in hours between updates of the app state update job. Get-SPAuthenticationProvider Returns an authentication provider. Get-SPAuthenticationRealm *New* Returns the authentication realms. Get-SPBackupHistory Returns a history of backup and restore operations. Get-SPBingMapsBlock *New* Sets Bing maps to blocked status. Get-SPBingMapsKey *New* Returns the Bing Maps key. Get-SPBrowserCustomerExperienceImprovementProgram Returns the current opt-in state for the browser Customer Experience Improvement Program. Get-SPBusinessDataCatalogEntityNotificationWeb *New* Returns the entity notification site. Get-SPBusinessDataCatalogMetadataObject Returns a Business Data Connectivity Metadata Store metadata object. Get-SPBusinessDataCatalogThrottleConfig Returns the throttling configuration for a Business Data Connectivity service application. Get-SPCertificateAuthority Returns the SharePoint certificate authority (CA). Get-SPClaimProvider Returns a claim provider. Get-SPClaimProviderManager Returns a claim provider manager. Get-SPClaimTypeEncoding *New* Returns a list of all the types of claims. Get-SPContentDatabase Returns one or more content databases. Get-SPContentDeploymentJob Returns a content deployment job or a collection of content deployment jobs. Get-SPContentDeploymentPath Returns a content deployment path or a collection of content deployment paths. Get-SPCustomLayoutsPage Returns a mapping to a custom layout page. Get-SPDatabase Retrieves all properties of a database. Get-SPDataConnectionFile Returns a data connection file or a collection of data connection files. Get-SPDataConnectionFileDependent Returns deployed forms on the server dependent on a universal data connection. Get-SPDesignerSettings Displays SharePoint Designer 2013 features. Get-SPDiagnosticConfig Retrieves ULS diagnostic configuration values of the farm. Get-SPDiagnosticsPerformanceCounter Returns a collection of performance counters. Get-SPDiagnosticsProvider Returns a diagnostics provider. Get-SPDistributedCacheClientSetting *New* Returns distributed cache settings from usage. Get-SPEnterpriseSearchComponent *New* Retrieves one or all search components in a given search topology. Get-SPEnterpriseSearchContentEnrichmentConfiguration *New* Returns the content enrichment configuration for the specified search service application. Get-SPEnterpriseSearchCrawlContentSource Returns a crawl content source. Get-SPEnterpriseSearchCrawlCustomConnector Returns a CustomConnector object type. Get-SPEnterpriseSearchCrawlDatabase Returns a crawl store. Get-SPEnterpriseSearchCrawlExtension Returns the file types to be included in the content index. Get-SPEnterpriseSearchCrawlMapping Returns a crawl mapping for the search application. Get-SPEnterpriseSearchFileFormat *New* Lists all parseable file formats. Get-SPEnterpriseSearchHostController *New* Lists the specified or all search host controllers in the farm. Get-SPEnterpriseSearchLanguageResourcePhrase Returns a language resource phrase. Get-SPEnterpriseSearchLinguisticComponentsStatus *New* Returns the status of the linguistic query and document processing components. Get-SPEnterpriseSearchLinksDatabase *New* Retrieves a reference to a links database. Get-SPEnterpriseSearchMetadataCategory Returns a crawled property category. Get-SPEnterpriseSearchMetadataCrawledProperty Returns a crawled property. Get-SPEnterpriseSearchMetadataManagedProperty Returns a managed property. Get-SPEnterpriseSearchMetadataMapping Returns the current state of a managed property mapping. Get-SPEnterpriseSearchOwner *New* Returns the search object owner. Get-SPEnterpriseSearchPropertyRule *New* Returns a property rule. Get-SPEnterpriseSearchPropertyRuleCollection *New* Returns the collection of rules that are applied to search results. Get-SPEnterpriseSearchQueryAndSiteSettingsService Returns the search manager service. Get-SPEnterpriseSearchQueryAndSiteSettingsServiceInstance Returns the service manager service instance. Get-SPEnterpriseSearchQueryAndSiteSettingsServiceProxy Returns the search manager service proxy. Get-SPEnterpriseSearchQueryAuthority Returns an authoritative page. Get-SPEnterpriseSearchQueryDemoted Returns a demoted site rule. Get-SPEnterpriseSearchQueryKeyword Returns a keyword term. Get-SPEnterpriseSearchQueryScope Returns a query results scope. Get-SPEnterpriseSearchQueryScopeRule Returns a shared scope rule. Get-SPEnterpriseSearchQuerySpellingCorrection *New* Returns the object that exposes the Query Spelling Correction (QSC) configuration. Get-SPEnterpriseSearchQuerySuggestionCandidates Returns a list of queries. Get-SPEnterpriseSearchRankingModel Returns a ranking model. Get-SPEnterpriseSearchResultItemType *New* Returns result item types. Get-SPEnterpriseSearchSecurityTrimmer Returns a custom security trimmer. Get-SPEnterpriseSearchService Returns the search service for a farm. Get-SPEnterpriseSearchServiceApplication Returns the search service application for a farm. Get-SPEnterpriseSearchServiceApplicationBackupStore *New* Retrieves information about the search service application backup files. Get-SPEnterpriseSearchServiceApplicationProxy Returns the search service application proxy. Get-SPEnterpriseSearchServiceInstance Returns the search service instance for a farm. Get-SPEnterpriseSearchSiteHitRule Returns the shared site hit rule. Get-SPEnterpriseSearchStatus Retrieves diagnostics information for the search components. Get-SPEnterpriseSearchTopology *New* Retrieves one or all search topologies that belong to a given search service application. Get-SPEnterpriseSearchVssDataPath *New* Retrieves the index paths for all active search index components on the current server. Get-SPExcelBlockedFileType Returns a file type or list of file types that are prevented from being loaded. Get-SPExcelDataConnectionLibrary Returns a trusted data connection library or a list of trusted data connection libraries. Get-SPExcelDataProvider Returns a safe data provider or a list of safe data providers. Get-SPExcelFileLocation Returns a trusted file location or a list of trusted file locations. Get-SPExcelServiceApplication Returns an SPExcelServiceApplication object. Get-SPExcelUserDefinedFunction Returns a user-defined function or a collection of user-defined functions. Get-SPFarm Returns the local SharePoint farm. Get-SPFarmConfig Returns a global property or a collection of global properties for the local farm. Get-SPFeature Returns the SharePoint features based on a given scope. Get-SPHelpCollection Returns Help collection files. Get-SPInfoPathFormsService Returns the InfoPath Forms Services in SharePoint Server 2013 settings that are in the farm. Get-SPInfoPathFormTemplate Returns an InfoPath 2013 form template. Get-SPInfoPathUserAgent Returns a user agent or all the currently defined user agents for the farm. Get-SPInfoPathWebServiceProxy Returns the web proxy settings for the web application. Get-SPInternalAppStateSyncLastRunTime *New* Returns the latest time the internal app state update job was invoked. Get-SPInternalAppStateUpdateInterval *New* Returns the interval in hours between updates of the internal app state update job. Get-SPIRMSettings *New* Returns the Information Rights Management (IRM) settings. Get-SPLogEvent Returns results from a Unified Logging Service (ULS) trace log. Get-SPLogLevel Returns a list of objects or diagnostic levels. Get-SPManagedAccount Retrieves accounts registered in the configuration database. Get-SPMarketplaceConnectionSettings *New* Returns SharePoint Store settings. Get-SPManagedPath Returns all managed paths that match the given criteria. Get-SPMetadataServiceApplication Returns the properties of a service application or a collection of service applications. Get-SPMetadataServiceApplicationProxy Returns the properties of a service application proxy or a collection of service application proxies. Get-SPMobileMessagingAccount Retrieves mobile messaging accounts for the specified web application. Get-SPODataConnectionSettingMetaData *New* Returns a Business Data Connectivity service metadata object. Get-SPOfficeStoreAppsDefaultActivation *New* Returns the properties of apps for Office. Get-SPPendingUpgradeActions *New* Displays pending upgrade actions. Get-SPPerformancePointServiceApplication Returns a PerformancePoint Service application object and properties. Get-SPPerformancePointServiceApplicationTrustedLocation Returns a trusted location object and properties for a PerformancePoint Services application. Get-SPProcessAccount Returns a system account or a managed account. Get-SPProduct Returns a list of the SharePoint-related products installed in the farm and the versions of all updates installed for each product. Get-SPProfileLeader Returns the current company leaders. Get-SPProfileServiceApplicationSecurity Returns permission and identity information. Get-SPRequestManagementSettings *New* Returns a Request Manager object. Get-SPRoutingMachineInfo *New* Returns all the routing targets. Get-SPRoutingMachinePool *New* Returns all available routing pools. Get-SPRoutingRule *New* Returns all routing rules. Get-SPScaleOutDatabase *New* Returns all scale-out database objects. Get-SPScaleOutDatabaseDataState *New* Returns the state information about the specified scale-out database. Get-SPScaleOutDatabaseInconsistency *New* Displays all inconsistencies related to scale-out databases’ ranges. Get-SPScaleOutDatabaseLogEntry *New* Queries a scale-out database for scale-out logs. Get-SPSecureStoreApplication Returns a Secure Store application. Get-SPSecureStoreSystemAccount *New* Returns a list of users from a designated list. Get-SPSecurityTokenServiceConfig Returns the security token service (STS) for the farm. Get-SPServer Returns the server or servers in the farm that match the given identity. Get-SPServerScaleOutDatabase *New* Returns all scale-out database objects. Get-SPServerScaleOutDatabaseDataState *New* Returns the state information about the specified scale-out database. Get-SPServerScaleOutDatabaseInconsistency *New* Displays all inconsistencies related to scale-out databases’ ranges. Get-SPServerScaleOutDatabaseLogEntry *New* Queries a scale-out database for scale-out logs. Get-SPServiceApplication Returns the specified service application. Get-SPServiceApplicationEndpoint Returns the endpoint of a service application. Get-SPServiceApplicationPool Returns the specified Internet Information Services (IIS) application pool. Get-SPServiceApplicationProxy Returns an instance of the specified service application proxy. Get-SPServiceApplicationProxyGroup Returns the proxy group for the specified service application. Get-SPServiceApplicationSecurity Returns the SPObjectSecurity object for a service application. Get-SPServiceContext Returns a service context. Get-SPServiceHostConfig Returns the common web service settings. Get-SPServiceInstance Returns the services instance for a specific server or the entire farm. Get-SPShellAdmin Returns the names of all users who have the SharePoint_Shell_Access role. Get-SPSite Returns all site collections that match the given criteria. Get-SPSiteAdministration Returns a site administration object that farm administrators can use to view certain information about site collections to which they might not have access. Get-SPSiteSubscription Returns the site subscription for the given URL or all site subscriptions in the local farm. Get-SPSiteSubscriptionConfig Returns the configuration properties of a site subscription. Get-SPSiteSubscriptionEdiscoveryHub Displays the eDiscovery hub for a site subscription. Get-SPSiteSubscriptionEdiscoverySearchScope Displays the search scope for the eDiscovery hub of the specified site collection. Get-SPSiteSubscriptionFeaturePack Retrieves available SharePoint feature sets or the Feature set assigned to a given site subscription. Get-SPSiteSubscriptionIRMConfig *New* Gets the Information Rights Management (IRM) settings. Get-SPSiteSubscriptionMetadataConfig Returns the site subscription configuration settings for a metadata service application. Get-SPSiteUpgradeSessionInfo *New* Manage or report site upgrade. Get-SPSiteUrl *New* Displays all URL mappings for the site. Get-SPSolution Returns a specified SharePoint solution. Get-SPStateServiceApplicationProxy Returns state service application proxies on the farm. Get-SPStateServiceDatabase Returns a state service database. Get-SPTaxonomySession Returns a TaxonomySession object. Get-SPThrottlingRule *New* Returns all throttling rules. Get-SPTopologyServiceApplication Displays properties of the topology service application for the current farm. Get-SPTopologyServiceApplicationProxy Retrieves the topology service application proxy. Get-SPTrustedIdentityTokenIssuer Returns an identity provider. Get-SPTrustedRootAuthority Returns a trusted root authority. Get-SPTrustedSecurityTokenIssuer *New* Returns the trusted security token issuer object. Get-SPUpgradeActions *New* Returns all upgrade actions. Get-SPUsageApplication Returns a specified usage application. Get-SPUsageDefinition Returns a usage definition object. Get-SPUsageService Returns a usage service. Get-SPUser Returns the user account or accounts that match a given search criteria. Get-SPUserLicense *New* Returns the list of supported SharePoint user licenses. Get-SPUserLicenseMapping *New* Returns the claim-to-user license mappings. Get-SPUserLicensing *New* Returns the state of user-license enforcement. Get-SPUserSolution Returns a specified sandboxed solution. Get-SPVisioExternalData Returns the settings for external data connections for a Visio Services application. Get-SPVisioPerformance Returns the Visio Services settings for the performance of a Visio Services application. Get-SPVisioSafeDataProvider Returns the settings of a safe data provider for a Visio Services application. Get-SPVisioServiceApplication Returns properties of a Visio Services application or a collection of Visio Services applications. Get-SPWeb Returns all subsites that match the given criteria. Get-SPWebApplication Returns all web applications that match the given criteria. Get-SPWebApplicationHttpThrottlingMonitor Reads all counters for network throttling on a web application. Get-SPWebPartPack Returns the Web Part packages that were installed for the specified scope. Get-SPWebTemplate Displays all globally installed site templates that match the given identity. Get-SPWorkflowConfig Returns workflow settings for the specified web application. Get-SPWOPIBinding *New* Returns a list of bindings that were created by using New-SPWOPIBinding on the current SharePoint farm where this cmdlet is run. Get-SPWOPISuppressionSetting *New* Returns the suppression settings on the current SharePoint farm where this cmdlet is run. Get-SPWOPIZone *New* Returns the zone that is configured on the current SharePoint farm for the WOPI application to use. Grant-SPBusinessDataCatalogMetadataObject Grants a right to a principal for the specified Business Data Connectivity Metadata Store metadata object. Grant-SPObjectSecurity Adds a new security principal to an SPObjectSecurity object. Import-SPAppPackage *New* Imports an app package. Import-SPBusinessDataCatalogDotNetAssembly Imports data that is associated with the Business Data Connectivity Metadata Store for a partition. Import-SPBusinessDataCatalogModel Imports a Business Data Connectivity Model. Import-SPEnterpriseSearchCustomExtractionDictionary *New* Imports a custom extraction dictionary. Import-SPEnterpriseSearchPopularQueries *New* Imports queries from a comma-separated list. The search box will suggest these queries as users type. Import-SPEnterpriseSearchThesaurus *New* Deploys the dictionary to the thesaurus component in the query processing flow. Import-SPEnterpriseSearchTopology Imports and activates a topology from an XML file. Import-SPInfoPathAdministrationFiles Imports InfoPath 2013 form templates and .udcx files that are located on the SharePoint Central Administration web site. Import-SPMetadataWebServicePartitionData Restores the data for a site subscription. Import-SPScaleOutDatabaseTenantData *New* Imports data from the specified subscription id. Import-SPServerScaleOutDatabaseTenantData *New* Imports data from the specified subscription id. Import-SPSiteSubscriptionSettings Restores a backup of subscription site settings to the given subscription identifier. Import-SPWeb Imports a site collection, web application, list, or library. Initialize-SPResourceSecurity Enforces resource security on the local server. Install-SPApp *New* Installs an instance of an app. Install-SPApplicationContent Copies shared application data to existing web application folders. Install-SPDataConnectionFile Installs the provided data connection file. Install-SPFeature Installs a SharePoint feature by using the Feature.xml file. Install-SPHelpCollection Installs the provided Help site collection files in the current farm. Install-SPInfoPathFormTemplate Installs an InfoPath 2013 form template on a farm. Install-SPService Installs and provisions services on a farm. Install-SPSolution Deploys an installed SharePoint solution in the farm. Install-SPUserSolution Activates a sandboxed solution in a site collection. Install-SPWebPartPack Installs the specified Web Part package to the specified location. Merge-SPLogFile Combines trace log entries from all farm computers into a single log file on the local computer. Mount-SPContentDatabase Attaches an existing content database to the farm. Move-SPBlobStorageLocation Copies a content database by using Remote BLOB Storage (RBS). Move-SPDeletedSite Moves deleted site collections from one content database to another. Move-SPEnterpriseSearchLinksDatabases *New* Repartitions data across links databases. Move-SPProfileManagedMetadataProperty Moves multiple-string values into a term set. Move-SPSite Moves site collections from one content database to another. Move-SPUser Migrates a user account in SharePoint 2010 Products. New-SPAccessServiceApplication Creates a new instance of an Access Services application. New-SPAccessServicesApplication *New* Creates a new instance of an Access Services application in SharePoint Server 2013. New-SPAccessServicesDatabaseServer *New* Adds a new SQL Server database to the list of servers. New-SPAlternateUrl Creates a new public or internal URL for the specified web application zone or resource. New-SPAppManagementServiceApplication *New* Creates an App Management Service application. New-SPAppManagementServiceApplicationProxy *New* Creates an App Management Service application proxy. New-SPAuthenticationProvider Creates a new authentication provider in the farm. New-SPAzureAccessControlServiceApplicationProxy *New* Creates a new service application proxy group. New-SPBECWebServiceApplicationProxy *New* Do not use this cmdlet. New-SPBusinessDataCatalogServiceApplication Creates a new Business Data Connectivity service application in the farm. New-SPBusinessDataCatalogServiceApplicationProxy Creates a new Business Data Connectivity service application proxy in the farm. New-SPCentralAdministration Creates a new SharePoint Central Administration web application. New-SPClaimProvider Registers a new claim provider in the farm. New-SPClaimsPrincipal Creates a new claims principal. New-SPClaimTypeEncoding *New* Registers a new type of claim. New-SPClaimTypeMapping *New* Creates a claim mapping rule for a security token service (STS) identity provider. New-SPConfigurationDatabase Creates a new configuration database. New-SPContentDatabase Creates a new content database and attaches it to the specified web application. New-SPContentDeploymentJob Creates a content deployment job. New-SPContentDeploymentPath Creates a new content deployment path. New-SPEnterpriseSearchAdminComponent *New* Creates a new admin component for the given topology and search service instance. New-SPEnterpriseSearchAnalyticsProcessingComponent *New* Creates a new analytics processing component for the given topology and search service instance. New-SPEnterpriseSearchContentEnrichmentConfiguration *New* Creates a new ContentEnrichmentConfiguration object. New-SPEnterpriseSearchContentProcessingComponent Creates a new content processing component for the given topology and search service instance. New-SPEnterpriseSearchCrawlComponent Adds a query component to a query topology. New-SPEnterpriseSearchCrawlContentSource Creates a new crawl content source for a shared search application. New-SPEnterpriseSearchCrawlCustomConnector Registers a protocol for custom crawling. New-SPEnterpriseSearchCrawlDatabase Creates a crawl database which can be added to a search service application. New-SPEnterpriseSearchCrawlExtension Adds an extension rule to a shared search application. New-SPEnterpriseSearchCrawlMapping Creates a crawl mapping rule for a shared search application. New-SPEnterpriseSearchCrawlRule Creates a new crawl rule. New-SPEnterpriseSearchFileFormat *New* Adds a new file format in the parsing system. New-SPEnterpriseSearchIndexComponent *New* Creates a new index component for the given topology and search service instance. New-SPEnterpriseSearchLanguageResourcePhrase *New* Adds a language resource phrase to a shared search application. New-SPEnterpriseSearchLinksDatabase *New* Creates a new links database for a search service application. New-SPEnterpriseSearchMetadataCategory Adds a crawled property category to a search service application. New-SPEnterpriseSearchMetadataCrawledProperty Adds a crawled property to a search application crawled property category. New-SPEnterpriseSearchMetadataManagedProperty Adds a managed property to a shared search application. New-SPEnterpriseSearchMetadataMapping Adds a managed property mapping to a shared search application. New-SPEnterpriseSearchQueryAuthority Adds an authoritative page to a shared search application. New-SPEnterpriseSearchQueryDemoted Adds a demoted site rule to a shared search application. New-SPEnterpriseSearchQueryKeyword Adds a keyword term to a shared search application. New-SPEnterpriseSearchQueryProcessingComponent *New* Creates a new query processing component for the given topology and search service instance. New-SPEnterpriseSearchQueryScope Adds a query results scope to a shared search application. New-SPEnterpriseSearchQueryScopeRule Adds a shared scope rule to a query scope. New-SPEnterpriseSearchRankingModel Adds a ranking model to a shared search application. New-SPEnterpriseSearchResultItemType *New* Creates a new result item type. New-SPEnterpriseSearchSecurityTrimmer Adds a custom security trimmer to a shared search application. New-SPEnterpriseSearchServiceApplication Adds a search service application to a farm. New-SPEnterpriseSearchServiceApplicationProxy Adds a new search application proxy to a farm..
New-SPEnterpriseSearchSiteHitRule Adds a new site hit rule for a search application. New-SPEnterpriseSearchTopology *New* Creates a new search topology in the given search service application. New-SPExcelBlockedFileType Adds a file type to the list of file types that Excel Services Application prevents from being loaded. New-SPExcelDataConnectionLibrary Adds a new data connection library to Excel Services Application. New-SPExcelDataProvider Adds a new safe data provider to Excel Services Application. New-SPExcelFileLocation Adds a new trusted location to Excel Services Application. New-SPExcelServiceApplication Creates a new instance of Excel Services Application. New-SPExcelUserDefinedFunction Adds a new user-defined function to Excel Services Application. New-SPLogFile Creates a new log file. New-SPManagedAccount Registers a new managed account. New-SPManagedPath Creates a new managed path for the given web application for all host header site collections. New-SPMarketplaceWebServiceApplicationProxy *New* Creates a service application proxy for the app identity data web service. New-SPMetadataServiceApplication Creates a new metadata service application. New-SPMetadataServiceApplicationProxy Creates a new metadata service application proxy. New-SPODataConnectionSetting *New* Creates a new Business Data Connectivity service connection. New-SPPerformancePointServiceApplication Creates a new service application for PerformancePoint Services. New-SPPerformancePointServiceApplicationProxy Creates a proxy for a PerformancePoint Services application. New-SPPerformancePointServiceApplicationTrustedLocation Creates a new trusted location for a PerformancePoint Services application. New-SPPowerPointConversionServiceApplication Creates a PowerPoint Conversion Service application. New-SPPowerPointConversionServiceApplicationProxy Creates a PowerPoint Conversion Service application proxy. New-SPProfileServiceApplication Adds a User Profile Service application to a farm. New-SPProfileServiceApplicationProxy Creates a User Profile Service application proxy on the local farm. New-SPRequestManagementRuleCriteria *New* Creates criteria for the rule to match. New-SPSecureStoreApplication Creates a new Secure Store application. New-SPSecureStoreApplicationField Creates a new Secure Store application fields object. New-SPSecureStoreServiceApplication Creates a new Secure Store Service application in the farm. New-SPSecureStoreServiceApplicationProxy Creates a new Secure Store Service application proxy in the farm. New-SPSecureStoreTargetApplication Creates a new Secure Store target application. New-SPServiceApplicationPool Creates a new Web service application pool. New-SPServiceApplicationProxyGroup Creates a new service application proxy group. New-SPSite Creates a new site collection at the specified URL. New-SPSiteSubscription Creates a new site subscription. New-SPSiteSubscriptionFeaturePack Creates a new SharePoint feature set that can be used to limit the features available to a site subscription. New-SPSubscriptionSettingsServiceApplication Creates a new subscription settings service application. New-SPSubscriptionSettingsServiceApplicationProxy Creates an application proxy to a subscription settings service application. New-SPTranslationServiceApplication *New* Provisions a new instance of the Machine Translation service. New-SPTranslationServiceApplicationProxy *New* Creates a Machine Translation Service application proxy on the local farm. New-SPTrustedIdentityTokenIssuer Creates an identity provider in the farm. New-SPTrustedRootAuthority Creates a trusted root authority. New-SPTrustedSecurityTokenIssuer *New* Creates a trust between a server to server principal. New-SPTrustedServiceTokenIssuer Creates a trust with a SharePoint farm. New-SPUsageApplication Creates a new usage application. New-SPUsageLogFile Starts a new usage log file on the current server computer. New-SPUser Adds an existing user to a SharePoint site with the designated permissions. New-SPUserLicenseMapping *New* Creates a license mapping object. New-SPVisioSafeDataProvider Adds a new data provider to a Visio Services application. New-SPVisioServiceApplication Adds a new Visio Services application to a farm. New-SPVisioServiceApplicationProxy Adds a new Visio Services application proxy to a farm. New-SPWeb Creates a new site in an existing site collection. New-SPWebApplication Creates a new web application within the local farm. New-SPWebApplicationExtension Creates a new zone instance for the web application. New-SPWOPIBinding *New* Creates a new binding to associate file name extensions or applications with actions on the current SharePoint farm where this cmdlet is run. New-SPWOPISuppressionSetting *New* The New-SPWOPISuppressionSetting cmdlet turns off Office Web Apps for the action and document type or binding you’ve specified on the current SharePoint farm. New-SPWordConversionServiceApplication Creates a new instance of a Word Automation Services application on the farm. New-SPWorkManagementServiceApplication *New* Creates a new Work Management Service application. New-SPWorkManagementServiceApplicationProxy *New* Creates a new service application proxy group. Publish-SPServiceApplication Shares the specified local service application outside the farm. Register-SPAppPrincipal Lets an on-premises or SharePoint Online administrator register an app principal. Register-SPWorkflowService Configures the SharePoint host to use a workflow service. Remove-SPAccessServicesDatabaseServer *New* Removes the specified database server. Remove-SPAlternateUrl Completely deletes the specified alternate URL. Remove-SPAppDeniedEndpoint *New* Removes an endpoint from the Apps denied endpoint list. Remove-SPAppPrincipalPermission *New* Removes the permissions on a specified app principal. Remove-SPBusinessDataCatalogModel Deletes a Business Data Connectivity Model. Remove-SPClaimProvider Unregisters a claim provider. Remove-SPClaimTypeMapping Deletes a claim type mapping rule for a security token service (STS) identity provider. Remove-SPConfigurationDatabase Permanently removes a configuration database. Remove-SPContentDatabase Deletes a content database. Remove-SPContentDeploymentJob Removes a content deployment job. Remove-SPContentDeploymentPath Removes a content deployment path. Remove-SPDiagnosticsPerformanceCounter Removes an instance of a performance counter. Remove-SPDistributedCacheServiceInstance *New* Removes an instance of the distributed cache service from a local server. Remove-SPEnterpriseSearchComponent *New* Removes the specified search component from the given search topology. Remove-SPEnterpriseSearchContentEnrichmentConfiguration *New* Removes the current content enrichment configuration from the search service application. Remove-SPEnterpriseSearchCrawlContentSource Deletes a specified crawl content source from a search application. Remove-SPEnterpriseSearchCrawlCustomConnector Removes a CustomConnector object. Remove-SPEnterpriseSearchCrawlDatabase Sets properties of a crawl database for a search service application. Remove-SPEnterpriseSearchCrawlExtension Removes a file name extension from the list of files that can be crawled. Remove-SPEnterpriseSearchCrawlLogReadPermission *New* Removes permission to view crawl log information. Remove-SPEnterpriseSearchCrawlMapping Deletes a crawl mapping. Remove-SPEnterpriseSearchCrawlRule Deletes a crawl rule. Remove-SPEnterpriseSearchFileFormat *New* Remove a previously registered file format from the system. Remove-SPEnterpriseSearchLanguageResourcePhrase Deletes a language resource phrase from a shared search application. Remove-SPEnterpriseSearchLinksDatabase *New* Deletes a links database. Remove-SPEnterpriseSearchMetadataCategory Deletes a crawled property category. Remove-SPEnterpriseSearchMetadataManagedProperty Deletes a metadata managed property. Remove-SPEnterpriseSearchMetadataMapping Deletes a metadata mapping from a managed property. Remove-SPEnterpriseSearchQueryAuthority Deletes an authoritative page. Remove-SPEnterpriseSearchQueryDemoted Deletes a demoted site rule. Remove-SPEnterpriseSearchQueryKeyword Deletes a query keyword. Remove-SPEnterpriseSearchQueryScope Deletes a query scope. Remove-SPEnterpriseSearchQueryScopeRule Deletes query results scope rules. Remove-SPEnterpriseSearchRankingModel Deletes a ranking model. Remove-SPEnterpriseSearchResultItemType *New* Creates a new result item type. Remove-SPEnterpriseSearchSecurityTrimmer Deletes a custom security trimmer. Remove-SPEnterpriseSearchServiceApplication Deletes a search service application. Remove-SPEnterpriseSearchServiceApplicationProxy Deletes a search service application proxy. Remove-SPEnterpriseSearchSiteHitRule Deletes a site hit rule. Remove-SPEnterpriseSearchTenantConfiguration *New* Removes all tenant specific search settings. Remove-SPEnterpriseSearchTenantSchema *New* Removes a defined search schema. Remove-SPEnterpriseSearchTopology *New* Removes an inactive search topology from a search service application. Remove-SPExcelBlockedFileType Removes an entry from the list of file types that are prevented from being loaded on Excel Services Application. Remove-SPExcelDataConnectionLibrary Removes a data connection library from Excel Services Application. Remove-SPExcelDataProvider Removes a data provider from Excel Services Application. Remove-SPExcelFileLocation Removes a trusted file location from Excel Services Application. Remove-SPExcelUserDefinedFunction Removes a user-defined function from Excel Services Application. Remove-SPInfoPathUserAgent Removes a user agent. Remove-SPManagedAccount Removes a managed account registration from the farm. Remove-SPManagedPath Deletes the specified managed path from the specified host header or web application. Remove-SPODataConnectionSetting *New* Removes a Business Connectivity Services connection. Remove-SPPerformancePointServiceApplication Deletes a PerformancePoint Services application from a farm. Remove-SPPerformancePointServiceApplicationProxy Deletes the proxy for a PerformancePoint Services application. Remove-SPPerformancePointServiceApplicationTrustedLocation Removes a single trusted location from a PerformancePoint Services application. Remove-SPProfileLeader Remove a company leader. Remove-SPRoutingMachineInfo *New* Removes an external routing target. Remove-SPRoutingMachinePool *New* Removes a routing pool from Request Manager. Remove-SPRoutingRule *New* Removes a routing rule. Remove-SPScaleOutDatabase *New* Removes a specific scale-out database. Remove-SPSecureStoreApplication Deletes a Secure Store application. Remove-SPSecureStoreSystemAccount *New* Removes a user account from a designated list. Remove-SPServerScaleOutDatabase *New* Removes a specific scale-out database. Remove-SPServiceApplication Deletes the specified service application on the local server. Remove-SPServiceApplicationPool Completely deletes the specified Web service application pool. Remove-SPServiceApplicationProxy Deletes the specified service application proxy. Remove-SPServiceApplicationProxyGroup Completely deletes the specified service application proxy group. Remove-SPServiceApplicationProxyGroupMember Removes one or more proxies from the specified service application proxy group. Remove-SPShellAdmin Removes a user from the SharePoint_Shell_Access role. Remove-SPSite Completely deletes an existing site collection and all subsites. Remove-SPSiteSubscription Removes data stored in a subscription settings service application for a set of site subscriptions. Remove-SPSiteSubscriptionBusinessDataCatalogConfig Removes the Business Data Connectivity Metadata Store for a partition. Remove-SPSiteSubscriptionFeaturePack Removes a SharePoint feature set from a site subscription. Remove-SPSiteSubscriptionFeaturePackMember Removes a feature definition from the provided SharePoint feature set. Remove-SPSiteSubscriptionMetadataConfig Removes site subscription configuration settings. Remove-SPSiteSubscriptionProfileConfig Deletes a site subscription from a User Profile Service application. Remove-SPSiteSubscriptionSettings Removes the settings service data for a specified site subscription, or finds and removes orphaned data. Remove-SPSiteUpgradeSessionInfo *New* Removes an SPSite object from upgrade. Remove-SPSiteUrl *New* Removes an URL mapping from the site. Remove-SPSocialAppPermissions *New* Do not use this cmdlet. Remove-SPSocialItemByDate Deletes tags, notes, or ratings. Remove-SPSolution Removes a SharePoint solution from a farm. Remove-SPSolutionDeploymentLock Removes the solution deployment lock for a server. Remove-SPThrottlingRule *New* Removes a throttling rule. Remove-SPTranslationServiceJobHistory *New* Removes Machine Translation service jobs. Remove-SPTrustedIdentityTokenIssuer Deletes a security token service (STS) identity provider from the farm. Remove-SPTrustedRootAuthority Deletes a trusted root authority. Remove-SPTrustedSecurityTokenIssuer *New* Removes the trusted security token service object. Remove-SPTrustedServiceTokenIssuer Deletes the object that represents the farm trust. Remove-SPUsageApplication Removes a usage application from the local farm. Remove-SPUser Removes a user from a web site. Remove-SPUserLicenseMapping *New* Removes a claim-to-SharePoint user license mapping. Remove-SPUserSolution Removes a sandboxed solution from the solution gallery. Remove-SPVisioSafeDataProvider Removes a data provider from a Visio Services application. Remove-SPWeb Completely deletes the specified web. Remove-SPWebApplication Deletes the specified web application. Remove-SPWOPIBinding *New* Removes bindings for applications, file name extensions, and their associated actions on the current SharePoint farm where this cmdlet is run. Remove-SPWOPISuppressionSetting *New* Removes the suppression settings for a file type or program ID (ProgID) on the current SharePoint farm where this cmdlet is run. Remove-SPWordConversionServiceJobHistory Removes entries from the Word Automation Services job history database. Rename-SPServer Renames a server that is currently connected to the farm. Repair-SPManagedAccountDeployment Repairs the local managed account credential deployment. Repair-SPSite Activates the RunRepairs method against the referenced SPSite object. Request-SPUpgradeEvaluationSite *New* Requests an upgrade evaluation site for a specified site. Reset-SPAccessServicesDatabasePassword *New* Resets the passwords for all logons for user application databases. Restart-SPAppInstanceJobs *New* Restarts an app instance. Restore-SPEnterpriseSearchServiceApplication Restores a third-party backup of a search application. Restore-SPEnterpriseSearchServiceApplicationIndex *New* Restores the search index from the specified backup files. Restore-SPFarm Restores one or more items from a backup. Restore-SPSite Restores a site collection. Resume-SPEnterpriseSearchServiceApplication Resumes a search service application that was suspended. Revoke-SPBusinessDataCatalogMetadataObject Revokes a right to a principal in the specified Business Data Connectivity Metadata Store metadata object. Revoke-SPObjectSecurity Removes a security principal from a SPObjectSecurity object. Set-SPAccessServicesApplication *New* Sets global properties of an existing Access Services application in SharePoint Server 2013. Set-SPAccessServicesDatabaseServer *New* Specifies whether or not a database in SQL Server is available. Set-SPAccessServicesDatabaseServerGroupMapping *New* Sets server group mappings. Set-SPAccessServiceApplication Sets global properties of an existing Access Services application. Set-SPAlternateUrl Configures the specified alternate URL. Set-SPAppAcquisitionConfiguration *New* Sets app acquisition settings. Set-SPAppAutoProvisionConnection *New* Sets provision connection settings for an app. Set-SPAppDisablingConfiguration *New* Sets the disable list sync state for an app. Set-SPAppDomain *New* Sets the domain used to host Apps. Set-SPAppHostingQuotaConfiguration *New* Sets hosting quotas for an app. Set-SPAppManagementDeploymentId *New* Sets the identifier of the farm or tenant used by the Office Marketplace to issue App licenses. Set-SPAppStoreConfiguration *New* Sets SharePoint Store settings for an app. Set-SPAppPrincipalPermission *New* Sets the permissions on a given app principal. Set-SPAppScaleProfile *New* Sets settings for the app profile. Set-SPAppSiteSubscriptionName *New* Sets or changes the name for the specified site subscription. Set-SPAppStateUpdateInterval *New* Sets the interval in hours between updates of the app state update job. Set-SPAuthenticationRealm *New* Sets the authentication realm. Set-SPBingMapskey *New* Sets the Bing Maps key. Set-SPBrowserCustomerExperienceImprovementProgram Turns on or off the browser Customer Experience Improvement Program. Set-SPBusinessDataCatalogEntityNotificationWeb Sets the entity notification site. Set-SPBusinessDataCatalogMetadataObject Sets the value of a property or attribute of a Business Data Connectivity Metadata Store metadata object. Set-SPBusinessDataCatalogServiceApplication Sets global properties for a Business Data Connectivity service application in the farm. Set-SPBusinessDataCatalogThrottleConfig Sets the throttling configuration for a Business Data Connectivity Service application. Set-SPCentralAdministration Sets the port for the SharePoint Central Administration web site. Set-SPClaimProvider Updates registration of a claims provider. Set-SPContentDatabase Sets global properties of a SharePoint content database. Set-SPContentDeploymentJob Sets properties of a content deployment job. Set-SPContentDeploymentPath Sets properties of a content deployment path. Set-SPCustomLayoutsPage Maps a new path for a custom layout page. Set-SPDataConnectionFile Sets properties of a data connection file. Set-SPDesignerSettings Sets SharePoint Designer 2013 features. Set-SPDiagnosticConfig Sets diagnostic configuration settings on the farm. Set-SPDiagnosticsProvider Enables a diagnostics provider and updates its retention policy. Set-SPDistributedCacheClientSetting Sets distributed cache settings. Set-SPEnterpriseSearchContentEnrichmentConfiguration *New* Stores the specified content enrichment configuration to the search service application. Set-SPEnterpriseSearchCrawlContentSource Sets the properties of a crawl content source for a shared search application. Set-SPEnterpriseSearchCrawlDatabase Sets properties of a crawl database for a search service application. Set-SPEnterpriseSearchCrawlLogReadPermission *New* Grants users permission to view the crawl log information. Set-SPEnterpriseSearchCrawlRule Sets properties for a crawl rule. Set-SPEnterpriseSearchFileFormatState Enables or disables parsing of a given file format. Set-SPEnterpriseSearchLinguisticComponentsStatus *New* Sets the operation status of the linguistic query and document processing components. Set-SPEnterpriseSearchLinksDatabase *New* Sets properties of a links database for a search service application. Set-SPEnterpriseSearchMetadataCategory Sets properties of a crawled property category for a shared search application. Set-SPEnterpriseSearchMetadataCrawledProperty Sets the properties of a metadata crawled property for a shared search application. Set-SPEnterpriseSearchMetadataManagedProperty Sets the properties of a metadata managed property. Set-SPEnterpriseSearchMetadataMapping Sets the properties of a managed property mapping for a shared search application. Set-SPEnterpriseSearchPrimaryHostController *New* Sets the primary search host controller for the farm. Set-SPEnterpriseSearchQueryAuthority Sets the properties of an authoritative page for a shared search application. Set-SPEnterpriseSearchQueryKeyword Sets the properties of a keyword term for a shared search application. Set-SPEnterpriseSearchQueryScope Sets the properties of a query results scope for a shared search application. Set-SPEnterpriseSearchQueryScopeRule Sets the properties of a shared scope rule for a query scope. Set-SPEnterpriseSearchQuerySpellingCorrection *New* Sets the operation status of the Query Spelling Corrections (QSC) component. Set-SPEnterpriseSearchRankingModel Sets the properties of a ranking model for a shared search application. Set-SPEnterpriseSearchResultItemType *New* Sets properties of a result item type. Set-SPEnterpriseSearchService Sets the properties of a search service for a farm. Set-SPEnterpriseSearchServiceApplication Sets the properties of a search service application for a farm. Set-SPEnterpriseSearchServiceApplicationProxy Sets properties of a search service application proxy. Set-SPEnterpriseSearchServiceInstance Sets the properties of a search service instance. Set-SPEnterpriseSearchTopology *New* Activates a given search topology. Set-SPExcelDataConnectionLibrary Sets properties of a data connection library for Excel Services Application. Set-SPExcelDataProvider Sets properties of a safe data provider for Excel Services Application. Set-SPExcelFileLocation Sets properties of a trusted file location for Excel Services Application. Set-SPExcelServiceApplication Sets global properties for Excel Services Application. Set-SPExcelUserDefinedFunction Sets properties of a user-defined function in Excel Services Application. Set-SPFarmConfig Sets a global property or a collection of global properties for the local farm. Set-SPInfoPathFormsService Sets parameters for InfoPath Forms Services in SharePoint Server 2013. Set-SPInfoPathFormTemplate Sets properties of an InfoPath 2013 form template. Set-SPInfoPathWebServiceProxy Sets parameters for an existing SharePoint Web service application. Set-SPInternalAppStateUpdateInterval *New* Sets the interval in hours between updates of the internal app state update job. Set-SPIRMSettings *New* Sets the Information Rights Management (IRM) settings. Set-SPLogLevel Sets the trace and event level for a set of categories. Set-SPManagedAccount Configures the managed account. Set-SPMarketplaceConnectionSettings Sets SharePoint Store connection settings. Set-SPMetadataServiceApplication Sets the properties for a metadata service application. Set-SPMetadataServiceApplicationProxy Sets the properties for a metadata service application proxy. Set-SPMobileMessagingAccount Configures the specified mobile messaging account. Set-SPODataConnectionSetting *New* Sets or updates global properties for a Microsoft Business Connectivity Services connection. Set-SPODataConnectionSettingMetaData *New* Updates properties for the metadata of a Business Connectivity Services connection. Set-SPOfficeStoreAppsDefaultActivation *New* Sets the properties of apps for Office. Set-SPPassPhrase Sets the passphrase to a new value. Set-SPPerformancePointSecureDataValues Sets global settings for the unattended service account. Set-SPPerformancePointServiceApplication Sets global run-time properties for a PerformancePoint Services application. Set-SPPowerPointConversionServiceApplication Configures settings for a PowerPoint Conversion Service application. Set-SPProfileServiceApplication Sets properties of a User Profile Service application. Set-SPProfileServiceApplicationProxy Sets properties of a proxy for a User Profile Service application. Set-SPProfileServiceApplicationSecurity Sets permission and identity information. Set-SPRequestManagementSettings *New* Sets Request Manager properties. Set-SPRoutingMachineInfo *New* Sets routing target properties. Set-SPRoutingMachinePool *New* Sets properties of a machine pool. Set-SPRoutingRule *New* Changes properties of an existing routing rule. Set-SPScaleOutDatabaseDataRange *New* Extends the range of a specified scale-out database. Set-SPScaleOutDatabaseDataSubRange *New* Creates a subrange for a specified scale-out database. Set-SPSecureStoreApplication Sets properties of a Secure Store application. Set-SPSecureStoreDefaultProvider Sets or updates the secure store provider. Set-SPSecureStoreServiceApplication Sets properties of a Secure Store Service application in the farm. Set-SPSecurityTokenServiceConfig Updates the settings of the SharePoint security token service (STS) identity provider. Set-SPServerScaleOutDatabaseDataRange *New* Extends the range of a specified scale-out database. Set-SPServerScaleOutDatabaseDataSubRange *New* Creates a subrange for a specified scale-out database. Set-SPServiceApplication Sets properties of a service application. Set-SPServiceApplicationEndpoint Sets the host of an endpoint for a service application. Set-SPServiceApplicationPool Changes the account used for the Identity of the specified application pool. Set-SPServiceApplicationSecurity Updates the SPObjectSecurity object for a service application. Set-SPServiceHostConfig Configures one or more common settings for all Web services. Set-SPSite Configures the specified site collection. Set-SPSiteAdministration Allows farm administrators to configure any site collection. Set-SPSiteSubscriptionConfig Sets the configuration properties of a site subscription. Set-SPSiteSubscriptionEdiscoveryHub Sets properties for the eDiscovery hub of a site subscription. Set-SPSiteSubscriptionIRMConfig *New* Sets the Information Rights Management (IRM) settings. Set-SPSiteSubscriptionMetadataConfig Sets the site subscription configuration settings for a specified metadata service application. Set-SPSiteSubscriptionProfileConfig Sets the parameters of a site subscription. Set-SPSiteUrl *New* Adds or changes an URL mapping for the site. Set-SPSubscriptionSettingsServiceApplication Sets properties of a subscription settings service application. Set-SPThrottlingRule *New* Changes properties of an existing throttling rule. Set-SPTimerJob Sets the schedule for running a timer job. Set-SPTopologyServiceApplication Sets the properties on the topology service application of the local farm. Set-SPTopologyServiceApplicationProxy Sets the proxy properties of the topology service application. Set-SPTranslationServiceApplication *New* Sets property settings on a Machine Translation service application. Set-SPTranslationServiceApplicationProxy *New* Sets properties to the Machine Translation service application proxy. Set-SPTrustedIdentityTokenIssuer Sets the identity providers of a web application. Set-SPTrustedRootAuthority Creates a new trusted root authority. Set-SPTrustedSecurityTokenIssuer *New* Sets the trusted token issuer. Set-SPTrustedServiceTokenIssuer Updates a trust with the farm. Set-SPUsageApplication Sets properties of a usage application. Set-SPUsageDefinition Sets the retention period for a usage provider. Set-SPUsageService Sets the properties of a usage service. Set-SPUser Configures properties on an existing user. Set-SPVisioExternalData Configures settings related to external data connections for a Visio Services application. Set-SPVisioPerformance Sets performance properties for a Visio Services application. Set-SPVisioSafeDataProvider Specifies a description of a safe data provider for a Visio Services application. Set-SPVisioServiceApplication Sets the ServiceApplicationPool property for a Visio Services application. Set-SPWeb Configures the specified subsite. Set-SPWebApplication Configures the specified web application. Set-SPWebApplicationHttpThrottlingMonitor Sets the Health Score bucket values for an existing network throttling performance counter for a specified web application. Set-SPWOPIBinding *New* Updates the default click action for an application or file name extension binding. Set-SPWOPIZone *New* Configures the zone that the current SharePoint farm will use to navigate the browser to the WOPI application. Set-SPWordConversionServiceApplication Sets properties of a Word Automation Services application. Set-SPWorkflowConfig Configures the workflow settings for the specified web application. Set-SPWorkManagementServiceApplication *New* Sets settings for the Work Management Service application. Set-SPWorkManagementServiceApplicationProxy *New* Sets the settings for the Work Management Service application proxy. Split-SPScaleOutDatabase *New* Moves a specified percentage of partitions from one scale-out database to another. Split-SPServerScaleOutDatabase *New* Moves a specified percentage of partitions from one scale-out database to another. Start-SPAdminJob Immediately starts any waiting administrative job on the local computer. Start-SPAssignment Initiates a new assignment store. Start-SPContentDeploymentJob Starts a content deployment job. Start-SPEnterpriseSearchQueryAndSiteSettingsServiceInstance Starts an instance of a search manager service. Start-SPEnterpriseSearchServiceInstance Starts an instance of a search service. Start-SPInfoPathFormTemplate Activates a previously quiesced InfoPath 2013 form template. Start-SPServiceInstance Starts the service instance for a service on a specific server or the farm. Start-SPTimerJob Runs a timer job once. Stop-SPAssignment Disposes of objects in the provided assignment collection. Start-SPDiagnosticsSession *New* Reports diagnostic information to the usage database. Stop-SPDiagnosticsSession *New* Stops the diagnostics session. Stop-SPDistributedCacheServiceInstance *New* Stops an instance of the distributed cache service on a local server. Stop-SPEnterpriseSearchQueryAndSiteSettingsServiceInstance Stops an instance of a search manager service. Stop-SPEnterpriseSearchServiceInstance Stops an instance of a search manager service. Stop-SPInfoPathFormTemplate Disables an InfoPath 2013 form template on a farm before an upgrade. Stop-SPServiceInstance Stops the service instance for a service. Suspend-SPEnterpriseSearchServiceApplication Suspends a search service application, pausing all crawls and search operations, to perform a task such as system maintenance. Test-SPInfoPathFormTemplate Validates that an InfoPath 2013 form template is browser-enabled. Test-SPSite *New* Activates the RunTests method against a referenced SPSite object. Uninstall-SPAppInstance *New* Uninstalls an instance of an app. Uninstall-SPDataConnectionFile Removes a data connection file. Uninstall-SPFeature Uninstalls an installed feature definition. Uninstall-SPHelpCollection Removes Help collection files. Uninstall-SPInfoPathFormTemplate Removes an InfoPath 2013 form template from a farm. Uninstall-SPSolution Retracts a deployed SharePoint solution. Uninstall-SPUserSolution Deactivates a sandboxed solution in a site collection. Uninstall-SPWebPartPack Uninstalls the specified Web Part package. Unpublish-SPServiceApplication Stops sharing the specified service application outside the farm. Update-SPAppCatalogSettings *New* Sets a specific site collection as the App Catalog site collection. Update-SPAppInstance *New* Updates the app instance. Update-SPFarmEncryptionKey Changes the value of the farm encryption key and, using the new key, re-encrypts all the data. Update-SPInfoPathAdminFileUrl Updates InfoPath 2013 form templates (.xsn files) and universal data connections (.udcx files), including all .xsn files and .udcx files that were deployed by an administrator. Update-SPInfoPathUserFileUrl Updates InfoPath form templates (.xsn files) and universal data connections (.udcx files). Update-SPRepopulateMicroblogFeedCache *New* Refreshes the cache. Update-SPRepopulateMicroblogLMTCache *New* Refreshes the cache. Update-SPSecureStoreApplicationServerKey Synchronizes the key on a server running SharePoint Server by using the Secure Store master key. Update-SPSecureStoreCredentialMapping Sets a new credential mapping for a Secure Store Service application. Update-SPSecureStoreGroupCredentialMapping Sets a new group credential mapping for a Secure Store Service application. Update-SPSecureStoreMasterKey Changes the master key of a Secure Store Service application. Update-SPSolution Upgrades a deployed SharePoint solution. Update-SPUserSolution Upgrades an activated sandboxed solution in a farm. Update-SPWOPIProofKey *New* Updates the public key that is used to connect to the WOPI application on the current SharePoint farm where this cmdlet is run. Upgrade-SPContentDatabase Upgrades a content database. Upgrade-SPEnterpriseSearchServiceApplication Upgrades a search service application. Upgrade-SPFarm Activates the Upgrade method for the local farm. Upgrade-SPSingleSignOnDatabase Migrates the application definitions from single sign-on (SSO) database to Secure Store database as target applications. Upgrade-SPSite Starts the upgrade process on a site collection. Mattias Gutke for all the support, help, ideas and for always beeing my second opinion. Niklas Goude Always helpful and all-knowing when it comes to PowerShell.